If the City of Iqaluit is serious about dealing with its looming water shortage, its focus should be building a pipeline to replenish its Lake Geraldine reservoir in early 2019. That’s according to Andrew Scott Medeiros, a Dalhousie University geographer who studies Nunavut’s water systems. 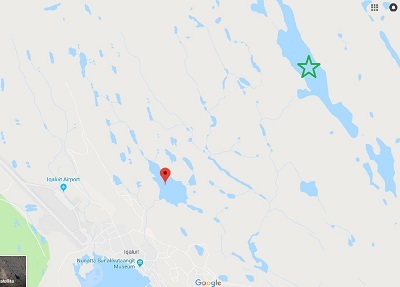 Iqaluit city council is faced with the dilemma of how to respond to low precipitation levels and increased demand for water at its Lake Geraldine watershed and reservoir, to ensure the city has a sufficient drinking water supply over the next year. City council struck a task force earlier this month to look into options, with the goal of supplementing the reservoir by October this year. But Medeiros said the research on Iqaluit’s freshwater issues has already been done. In a 2017 paper he co-authored, Medeiros and fellow researchers looked at alternative freshwater sources for the city. “A replenishment program that transfers water into Lake Geraldine during the late winter or early spring would have more of an impact on extending the lifespan of the water supply as replenishment would occur when lake levels are at their lowest,” the 2017 study found. “Such a replenishment pipeline would require specific design considerations to prevent freezing along with a permanent intake installation allowing for extraction below the layer of lake/river ice. Researchers looked at the viability of drawing freshwater from the Apex River but concluded the river would only have the capacity to provide water over a two-year period. The Sylvia Grinnell River is another shorter-term source, Medeiros said. But he pointed to several other deeper lakes just outside the city that have much better capacity to replenish the reservoir, like one northeast of Lake Geraldine (see map). The challenge now is to develop the cold-weather engineering to pump water to the reservoir, Medeiros said, adding that should be the city’s focus, rather than convening a task force. Iqaluit’s aging utilidor infrastructure is also a major concern—one that city councillors have also committed to tackle to help prevent freshwater waste. Medeiros said used water empties the system as waste water, rather than returning to its source for treatment and re-use as in many other cities. An estimated 40 per cent of water drawn from Lake Geraldine is bled or leaked from the system. The average per capita daily water use in Canada is about 200 litres per person; in Iqaluit, Medeiros said residents use an average of 400 litres per day. Next Next post: Macleans: What happens when Nunavut’s rapidly growing capital city runs out of water?